...because of course, a busy mom of three kids ages 3 and under has so much on her brain that she would forget to write about the fourth book in her last post! Oops! 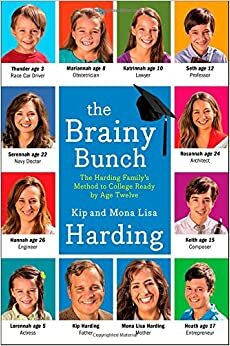 This book details the Harding family's unique journey of homeschooling their ten children on an accelerated pace such that more than half of their brood (so far) have started and finished college far earlier than the average student. I'm not talking about dual credit high school students but rather 11 and 12 year olds starting college studies. If my memory serves me correct (since I read this book last spring), several of their children finished their bachelor degrees somewhere between ages 16 and 19. The Hardings claim that none of their children are geniuses nor do they have particularly stellar I.Q.s. The secrets to their early academic achievements, which they describe in the book, lie in their diligent efforts and ambitions, and the parents' belief that children are capable of learning far more from an early age than we give them credit. The Hardings have been criticized for pushing their children too far too fast and not allowing them a "normal childhood." However, according to what they write in this book and the honest glimpse into their daily lives that they allow readers to see, their children do indeed live normal childhoods and are not pushed into anything they don't care to attempt. Most of their children, however, are so motivated by what they see their older siblings accomplish, that they strive to follow in their footsteps. And outside of their high-level book work, they run in the backyard, create skits, play board games, do sports, play music, and socialize with friends just like other children/young people. In other words, the Hardings are a very "normal" family with the exception of the academic levels at which their children operate. One of the reasons their children have been able to get ahead in their studies compared to most peers is due to the fact that the Hardings school year-round, a not uncommon approach being taken by many homeschoolers. This allows their children the benefit of not having to do a lot of review work at the beginning of a new school year and thus move more quickly through their grade levels. They still take shorter breaks when needed throughout the school year, but not for three months at a time during the summer. While I am not necessarily convinced just yet that I want to groom my children to start college by the age of 12, there were many aspects to this book that I enjoyed and that gave much food for thought. 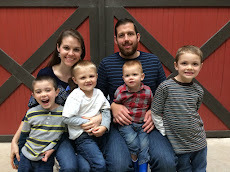 I appreciated reading their family's journey thus far, what their adult children are now doing with their education and careers, their desire to focus in on each child's unique talents and interests, the practical-how-tos of their homeschooling advice, and how their Christian faith is the foundation in all they do as parents and teachers. I will definitely be re-reading this engaging and inspirational book again soon! Yes, I did get your comment...responding now! :) I haven't heard of "No Regrets", but it sounds interesting!